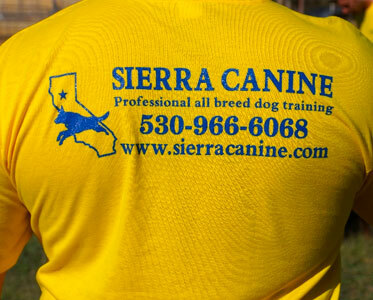 Sierra Canine works differently than other dog training companies. Our programs are customized to the goals that our customers have for their dogs. Depending on what you would like to get accomplished with your dog would determine the amount of lessons and therefore the cost. During our consultation, a description of the various commands and behaviors that are associated with the variety of training levels will be made available for you to choose from. You will also be informed of our training philosophy, length and frequency of our lessons as well as your level of participation in your dog’s training program. A high percentage of our training is the rehabilitation of negative behaviors such as dog aggression, anxiety, anxiety or dominance that is promoting aggression towards strangers or guests in your home. With these cases, an evaluation is essential in an effort to diagnose the type of aggression and what is promoting it. If you are interested in scheduling a consultation and evaluation, the quickest response to an inquiry would be to call our phone number: 530.966.6068. In the event that you have to leave a voicemail message, I will return your call as soon as possible. If you chose to submit an email, please provide a phone number as well. If you still have some questions about our training services, please take a moment to review some of the most frequently asked questions that we receive. If there is a question that is not answered below, please feel free to contact me! A: No, we do not offer group classes. If you’ve read the information on the “Things to Consider” page you will learn why I think group classes, go against the proper steps or progressions of dog training. Q: What is the best age to start training my dog? A: The earlier the better. I start my own puppies at eight weeks, with customer’s dogs, I suggest twelve weeks of age. That said, your dog is never really too old to train or change undesirable behaviors. Q: What training method do you use? A: Every dog or puppy is unique. There are several factors that determine what system or method I will use in training your dog. Is your dog motivated by food or not? Is your dog outgoing, confident and sound or is your dog shy, insecure or weak nerved? Is your dog environmentally high or low threshold? Meaning, your dog can handle a high level of environmental stimulation before it causes a response or very little environmental stimulation causes your dog to lose focus. Q: Do you train Pit Bulls or other bully breeds? A: Yes, I do not discriminate against any breed. All breeds are welcome. Q: If I have one or more dogs, can I train them all at the same time? A: Yes. A number of my customers have more than one dog. Each dog will be trained or worked with individually. A significant discount will be given on any program purchased that includes more than one dog. A: I accept all forms of payment, cash, check or credit card. A: The length or amount of lessons in a program is determined by what training goals you have for your dog. An average basic obedience program is seven lessons. Q: Can my dog stay with you for the duration of their training? A: Yes, we do offer board and train programs, but spots are limited. We suggest contacting us as soon as you’re considering this option. I would like to give you my sincere thanks for a job well done. Your professionalism, patience, kindness and true love of animals is apparent in the way you conduct yourself while working. As you know, Flannigan was quite a hyperactive handful when you met him. It brings me great pleasure to walk him now without him dragging me along for the ride. Just want to say 'Thank You' for your help with Kibo. I've spent the last two years spinning my wheels and not getting the results I needed. In just two months working with you the progress we have made is amazing. Thank you so much!